In 1927, roller coaster builder Harry Traver built the first portion of what would become The Comet. Its name back then was "The Cyclone", and its first home was Crystal Beach Amusement Park in Ridgeway, Ontario, Canada. The Cyclone was hailed as "the most intense coaster ever," and was thought to be so extreme that a nurses station was even installed near the exit of the ride so ailing patrons could be easily assisted. Its tight turns and nearly vertical, spiraling drop threatened to throw riders from their seats at any moment. In 1946, the park experienced a significant drop in attendance, and The Cyclone was dismantled. To attract more customers, Crystal Beach hired the Philadelphia Toboggan Company and roller coaster designer Herbert Schmeck to design a replacement coaster that was bigger, better, and safer than The Cyclone. The Crystal Beach Comet was introduced in 1948, having risen from the old steel that once supported The Cyclone, and it was an instant success. But only 41 years later, Crystal Beach Amusement Park closed, and its beloved Comet seemed destined for the scrap heap. One month after Crystal Beach closed, a man from Lake George purchased the wooden roller coaster for $210,000. That man was Charles R. Wood, who at the time owned The Great Escape Fun Park in Queensbury NY, just a short distance south of Lake George Village. It took just over three years for The Comet's approval process to be completed, and reconstruction of the coaster began when it was pulled out of storage in October 1993. Rebuilding The Comet took more than 49 tractor-trailer loads of steel, more than 1,000 concrete footers, and countless hours of sandblasting, restoring, priming, and re-assembling. In June of the next year, The Comet opened to the public, and was instantly one of the most popular rides in the park. It was only The Great Escape's second roller coaster at that time (along with the Steamin' Demon), and was the park's first new ride since the Raging River debuted six years earlier. Six Flags Great Escape reports that The Comet is still the park's main attraction, drawing more than 400,000 rides each season. Its 95-foot-tall frame is easily visible from great distances, and its 4,197 foot long track provides a lengthy, fun ride like no other coaster. It reaches speeds of up to 60 miles per hour, and features drops that surprise even the most experienced riders. 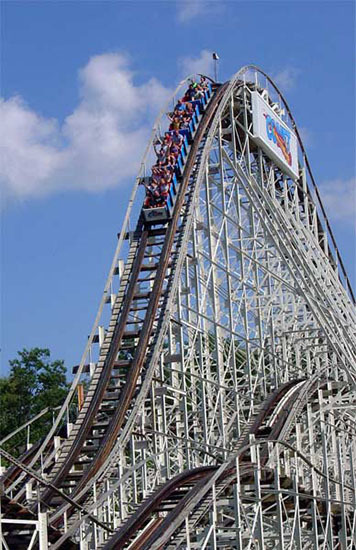 In September 2009, The Comet was recognized by the American Coaster Enthusiasts with a Coaster Landmark Award. It is one of just 35 coasters in the United States and Canada to earn such a distinction. Ride the comet for yourself at The Great Escape & Hurricane Harbor near Lake George, NY!